In spring the shops are stocked with chocolate eggs, sweets and indulgent treats in preparation for Easter. And as much as we love to treat ourselves to chocolate bunnies and creme eggs, they’re high in fats and sugars that aren’t good for us or our families. You don’t even want to know how many calories and grams of sugar are in a Cadbury’s creme egg –sigh! But, Easter doesn’t have to be a chocolate holiday as there are plenty of healthy alternatives that are fun to try and still festive. Although a granola Easter egg may not sound as appetising it’s surprisingly tasty, as we also have a healthier version of carrot cake, vegan creme eggs and strawberry carrots! Kids will love to make Easter egg breakfast pops and might even eat their fruit if it’s cut in cute bunny shapes, as these healthy recipes are for the whole family to try and enjoy. Whether you’re planning an Easter themed party or you’re looking for a chocolate Easter egg alternative, these healthy treats are sure to please both the health-conscious and the kids! Not only are they kid-friendly, but there's also gluten-free, dairy-free and vegan options too. So here are healthy Easter treats we can’t wait to make –goodbye to the chocolate egg! If don’t want your kids indulging on chocolate on Easter morning, then these fun Easter egg breakfast pops make a good alternative. With a super simple recipe that the kids can join in with, these tasty egg-shaped pops are full of yoghurt, granola and blueberries. If you’re going to be healthy then you need to get creative! It may sound simple but cute bunny shaped fruit might actually persuade your child to eat the healthy stuff they often want to avoid or it might just get you in the Easter spirit –without the chocolate you regret eating! Although this recipe uses candy, you can dip your strawberries in yoghurt with natural orange food colouring or allow yourself a small treat; after all you’re still eating strawberries –right?! Theses dipped strawberries make a great feature on your Easter table and they’re seriously easy to make. It’s not fair for the super health-conscious to miss out an Easter egg, as this yummy and nutritious alternative still lets you join in on the spring festivities. It’s loaded with protein and fibre, but also has a sweet crunch to it. Grain-free and gluten-free these healthier carrot cupcakes are the perfect Easter treat, for fewer calories. You can drizzle them lightly with vegan cream cheese to be extra healthy, as this by the tastiest healthy Easter sweet. If cake is your weakness, but you’re trying to consume fewer calories this Easter, then this is the recipe for you. 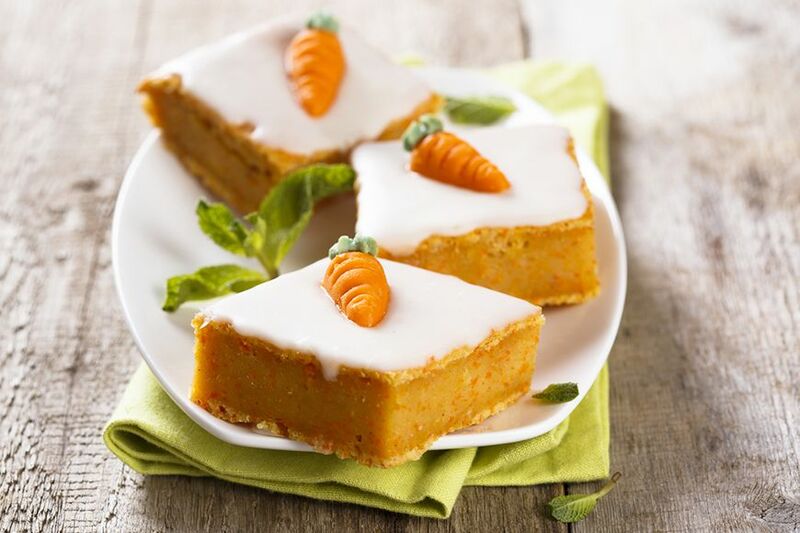 With less syns this cake is for the dieters in the family who don’t want to miss out on dessert, it’s a healthier option but there are still a couple of mini eggs, it is Easter after all! For Easter fun and still clean eating, these vegan cream eggs are perfect. The paleo treat is raw, gluten-free, grain-free and free from unrefined sugars, but still tastes amazing. It’s not the easiest recipe to follow, but that’s all part of the fun and they’re definitely worth it in the end.